Full-service, Single-source Packaging Manufacturing & Suppliers. Whether your needs are straightforward (stock corrugated cartons and bubble wrap) or complex (custom-designed shockproof packaging for fragile electronics), or anything in between, Romanow Container has you covered. Corrugated products – If it is corrugated, we do it. From stock sized standard RSC boxes to product-specific custom interior and exterior designed solutions. Designed, tested, certified and produced in our own state of the art manufacturing facility. Industrial packaging supplies – Typically, if you need stock boxes, you’ll also need tape, stretch film, bubble wrap, loose fill, etc. We have all that, too. Protective packaging – If your product is baked muffins or printed-circuit boards, you have to think about crush and shock protection. We bought a whole company just to ensure our leading-edge capabilities in protective packaging. Custom Wood Crating & Specialty Wood Products - If your product requires specialized wood crating or custom wood products of any kind, we do that too. Our comprehensive wood shop has all of the equipment necessary to produce domestic as well as export compliant custom wood crating, custom wood and suspension pallets or specialty wood products to safely ship your products anywhere in the world. Custom packaging solutions – Many products simply don’t work with a standard box, whether because of shape or protective requirements. Our engineering and design group – second to none in the industry – will design a container that’s just perfect for your product. Point of purchase displays – Is your product sold at events, or through retail stores? Our designers will work with you to create POP displays that stop traffic and kick-start sales. Managed materials inventory and distribution – Short of floor space? ...you’d be surprised how many manufacturers are. That’s why we devote some of our space to holding customer stock, from which they can take delivery on a just-in-time basis ...whether at just one plant, or several scattered across New England. 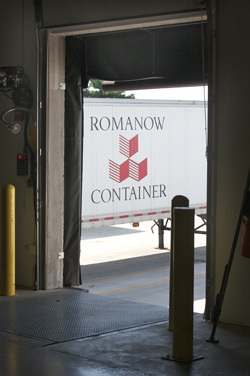 Whether you need just some or all of the above, Romanow is prepared to be your one-stop, comprehensive packaging solutions provider... with customer service that truly delights. Give us a try and experience the Romanow difference.